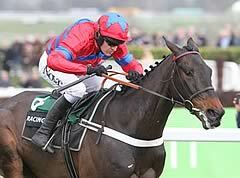 Sprinter Sacre was outgunned by Dodging Bullets on his comeback after 386 days off the racecourse. Nicky Henderson's superstar travelled with his usual fluency and drew gasps from the crowds with some of his leaps in the hands of Barry Geraghty, but he had no answer to the Tingle Creek winner. Trained by Paul Nicholls and bred by Frankie Dettori, the Noel Fehily-ridden Dodging Bullets had Sprinter Sacre's measure approaching the final fence and went on to win by three lengths to confirm his status as one of the most improved horses in training. Sprinter Sacre, sent off the 4-6 favourite, won his first 10 starts over fences before he was pulled up at Kempton in December 2013 with a fibrillating heart. He was n ursed back to health, but Henderson had agonised over whether to run him on soft ground. He had, however, been to Newbury for a public schooling session with stable companion Tanks For That, where he demonstrated he was back to something like his old self. Henderson expects Sprinter Sacre to have gained plenty from the run ahead of a possible attempt to regain his crown in the Betway Queen Mother Champion Chase at the Cheltenham Festival in March. The Seven Barrows handler said: "Barry just said 'great'. He showed the old Sprinter was still there and turning into the straight you were happy. He said he took off with him four out and got him racing. "It was great to see he was full of his enthusiasm, he travelled into the straight like himself and just got tired. There was no messing about. They went a good gallop and it just found him out in the end. I loved the way he travelled and I'm pleased we decided to run. "He just got a little bit tired. Only one day matters and he'll come on plenty for it." Fehily said of the 7-2 winner: "It's another great training performance from Paul Nicholls. They went hard from flag-fall. He stays well, and the Cheltenham hill wouldn't be any problems for him. 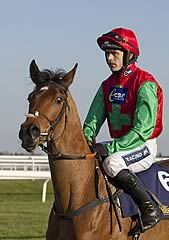 He's a great horse." Nicholls is on holiday in Barbados, but tweeted: "Well done Team Ditcheat. Proud of you all." The handler's assistant Tom Jonason said: "He's on an upward curve but he's improving so much physically and is bigger and stronger. This came off the back of a career-best in the Tingle Creek, so that has proved to be solid form. "Sprinter may have needed the run, but our lad's performance was absolutely out of the top drawer. He's also improved mentally and gradually gets better and better. It was a perfectly judged ride from Noel - they went very hard early and it was an absolute peach."